I’ve never added books I’ve read during my morning devotions to the books I’ve reviewed, but this year that quiet time I have in the mornings was very special to me, and I wanted to share with you some of the books I read that made it so. Jesus Calling by Sarah Young is a tremendously popular book in my area. I don’t know if it has the notoriety across the US it has in Atlanta, but if so, then you may have already heard of it. It is a daily devotional – very short reading (~150 words) – written in first person with Jesus as the narrator. Two to three scripture references are given for each entry, so that if a given message is particularly meaningful, you can easily find the scripture it is based on. My mom gave this to me last Christmas, and I’ve also given it several times. On mornings when I was rushed and didn’t have time for a longer devotion, this bite-sized portion sufficed until I had more time. There is also a child’s version that my nieces have, and I loved our week at the beach when we were reading the same message & scripture reference. 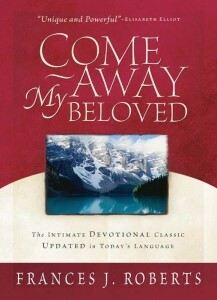 If you’re familiar with Jesus Calling, have loved it but would like a little more, go find Come Away My Beloved by Frances J. Roberts. 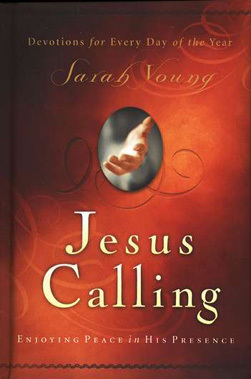 This classic devotional is written in the same style as Jesus Calling – in the voice of Jesus – but has a more depth and length to its passages. It is a collection of about 200 meditations, some poetry but mostly prose. However, even the prose is lyrical. I found the passages incredibly encouraging and comforting. With both of these books – as has been the case with most things I read during my quiet time – it is amazing how often the passages speak to what you need to hear. Both of these are highly recommended and would be great additions to your 2012 devotional reading.